Motorsport governing body, the Federation Internationale de l’Automobile (FIA), plan to sue Ferrari and the seven other Formula One teams threatening to set up a breakaway championship next season, for breach of contract. Following meetings between FIA president Max Mosley and F1 supremo Bernie Ecclestone at Silverstone on Friday, the FIA has now decided legal action is their only recourse. Confirming their intentions, a statement read: “The FIA’s lawyers have now examined the threat by the eight-member Formula One Teams Association (FOTA) to begin a breakaway series. “The actions of FOTA as a whole, and Ferrari in particular, amount to serious violations of law including wilful interference with contractual relations, direct breaches of Ferrari’s legal obligations and a grave violation of competition law,” the statement added. “The FIA will be issuing legal proceedings without delay. Preparations for the 2010 FIA Formula One World Championship continue but publication of the final entry list will be put on hold while the FIA asserts its legal rights.” Meanwhile, Formula One’s sole commercial rights holder and overall supremo, Bernie Ecclestone, has dismissed the threat of the eight FOTA teams breaking away to form a new championship. Ecclestone told the BBC: “I don’t think it will happen. I’m not concerned at all. Formula One has been going for 60 years and that won’t change anytime soon.” When asked how he saw the crisis progressing the 78-year-old added: “I don’t know where we are at the moment so I don’t know where we’ll go.” Ecclestone’s comments came after the eight teams announced their intentions to create a breakaway championship following a financial dispute with the world governing body over a proposed budget cap for next season. All eight teams — Ferrari, BMW-Sauber, Brawn GP, McLaren-Mercedes, Red Bull, Renault, Toro Rosso and Toyota — announced their plans in a press release after a meeting on Thursday. Silverstone’s last hurrah. 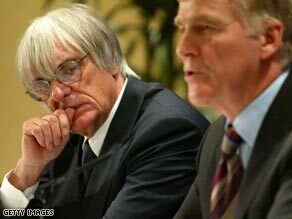 » The current crisis stems from controversial plans by the Mosley-led FIA to impose a budget cap of $60M for competing teams in 2010. Though the FIA hope such plans will make the grid more balanced and easier for the smaller teams to compete successfully, FOTA complain the wishes of the majority of teams have been “ignored.” “Furthermore, tens of millions of dollars have been withheld from many teams by the commercial rights holder, going back as far as 2006,” FOTA added in a statement. “These teams therefore have no alternative other than to commence the preparation for a new championship which reflects the values of its participants and partners,” the statement continued. The association said its series will “have transparent governance, one set of regulations, encourage more entrants and listen to the wishes of the fans, including offering lower prices for spectators worldwide, partners and other important stakeholders.” Brawn GP’s Nick Fry, the chief executive of the team leading both the constructors’ and drivers’ championship, told the BBC: “We mean it — it was a difficult decision but we’ve negotiated with Bernie and the FIA in good faith and now it looks like we’ll do something different. “Some of the decision-making [regarding the governance of the sport] have been done without the consensus of those taking part, we’re not against the reduced costs but the cap is too low, ” Fry added. But Fry, whose Brawn team told CNN they had warmed to the FIA’s plans initially, was still convinced there would be F1 next season but was unsure of the “format.” Currently only five teams have committed to racing in next season’s championship: Williams and Force India, who were expelled from FOTA for agreeing to participate, and new teams Campos GP, Manor F1 and Team US F1. Jackie Stewart, a former Formula One triple world champion, told the Guardian newspaper that Mosley may have to “leave his post.” “I think they [the teams] do want Max to go because frankly some of the decisions made over the years have been very questionable. I think a lot of people are kind of fed up with the dictatorial attitude. He has a great position of power but big trees do blow over,” Stewart added.